An emerald ash borer on a leaf. MADAWASKA, Maine - Maine is trying to root out an invasive forest pest, and it's inviting the public to learn how to help. In this Oct. 26, 2011 file photo, the markings left from emerald ash borer larvae on an ash tree are pointed out in Saugerties, N.Y. The emerald ash borer is a threat to Maine's forest products economy and has been located in the state. 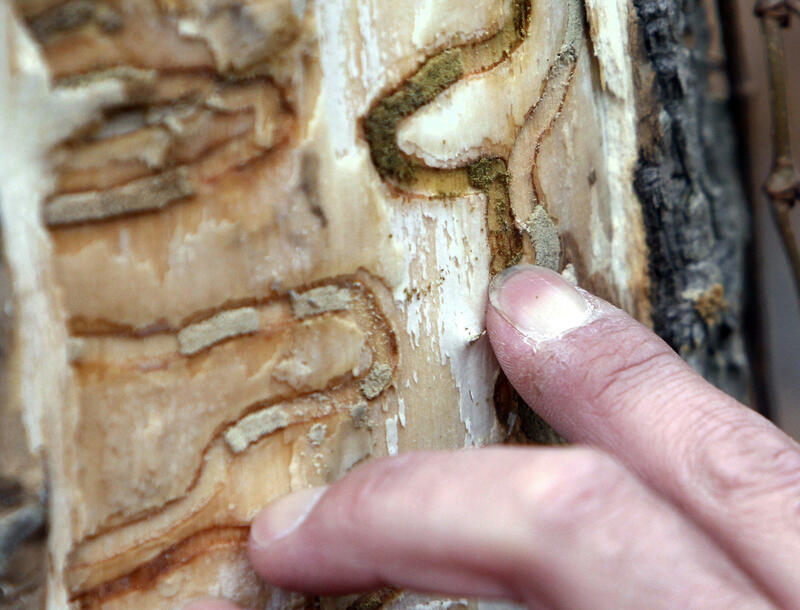 The Maine Forest Service is hosting a "log-peeling workshop'' to look for signs of the borer, which has killed hundreds of millions of ash trees nationwide and in Canada since 2002. The forest service says it will be peeling sections of felled trees to look for signs of the borer. The event is scheduled for Nov. 15 at the Madawaska Town Garage, and will be followed by similar events in southern and central parts of the state. The service says landowners, foresters and members of the general public are invited.